Are you looking for a property maintenance and handyman company you can trust to maintain your spaces inside and out? Are you looking for construction remodeling or maintenance services for a residential or commercial property? Follow Me Construction and Home Maintenance is ready to help! When you use FMC for your property maintenance and handyman needs, you can count on the highest quality of craftsmanship in Kansas City. Investing in your city can be quite rewarding. As a landlord, you understand a single family, multi-unit or commercial property needs to be properly maintained, which is a seemingly never-ending task. Staying on top of your property’s maintenance and handyman needs can be stressful and time consuming. Let Follow Me Construction and Home Maintenance help you with this task. FMC will respond promptly to your needs or the needs of your tenant. We offer on-site assessments of problems or property maintenance projects. 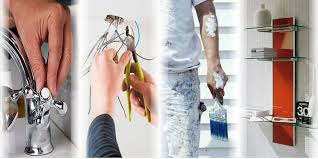 We are affordable and offer repair and renovation services for your property inside and out. You can count on us to communicate quickly with a solution and economical estimate, and we guarantee to work professionally and on budget. Our Project Manager supervises your project from start to finish and our highly-trained staff will treat your property with respect, cleaning up at the end of each day. If preferred, we can deal directly with your tenant and keep you in the loop by email or phone. From plumbing leaks to appliance installation, we will handle the repairs for you. We can inspect your property periodically and provide you a list of recommended, needed and immediately required repairs. In this way, FMC can help you protect the value of your property. Keeping up with improvements is important to maintaining the value of your property and can save you in the long run from major repairs. Let Follow Me Construction and Home Maintenance help you today!